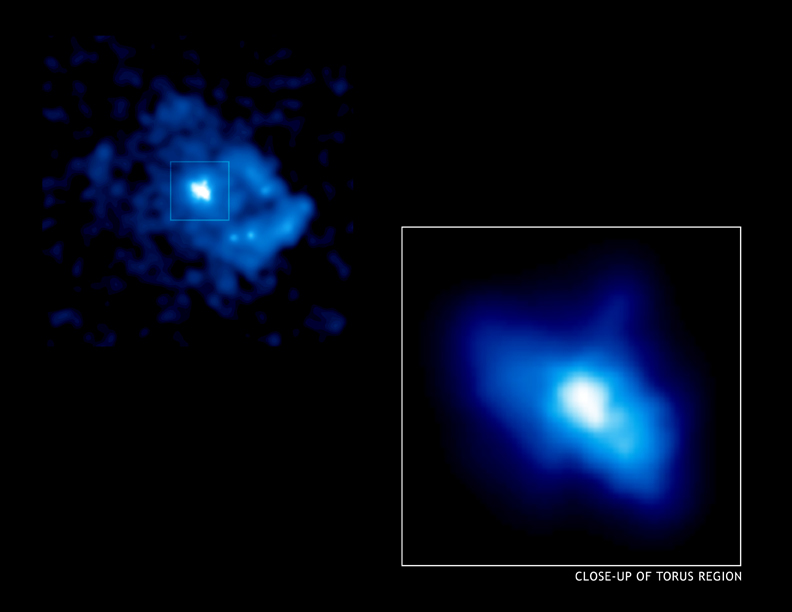 The Chandra image of SNR 0540-69.3 clearly shows two aspects of the enormous power released when a massive star explodes.An implosion crushed material into an extremely dense (10 miles in diameter) neutron star, triggering an explosion that sent a shock wave rumbling through space at speeds in excess of 5 million miles per hour. The image reveals a central intense white blaze of high-energy particles about 3 light years across created by the rapidly rotating neutron star, or pulsar. Surrounding the white blaze is a shell of hot gas 40 light years in diameter that marks the outward progress of the supernova shock wave. the pulsar is generating power at a rate equivalent to 30,000 Suns. This pulsar is remarkably similar to the famous Crab Nebula pulsar, although they are seen at vastly different distances, 160,000 light years versus 6,000 light years. Both SNR 0540-69.3 and the Crab pulsar are rotating rapidly, and are about a thousand years old. Both pulsars are pumping out enormous amounts of X-radiation and high-energy particles, and both are immersed in magnetized clouds of high-energy particles that are a few light years in diameter. Both clouds are luminous X-ray sources, and in both cases the high-energy clouds are surrounded by a filamentary web of cool gas that shows up at optical wavelengths. However, the extensive outer shell of 50 million degree Celsius gas in SNR 0540-69.3 has no counterpart in the Crab Nebula. This difference is thought to be due to environmental factors. The massive star that exploded to create SNR 0540-69.3 was evidently in a region where there was an appreciable amount of gas. The supernova shock wave swept up and heated the surrounding gas and created the extensive hot X-ray shell. A similar shock wave presumably exists around the Crab Nebula, but the amount of available gas is apparently too small to produce a detectable amount of X-radiation. 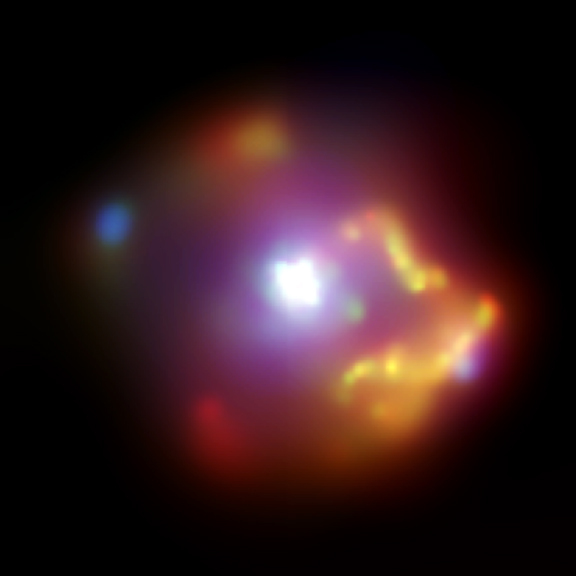 Scale Image is 1.7 arcmin across. Coordinates (J2000) RA 05h 40m 11s | Dec -69° 20´ 00"